Is it English ivy, or Fatsia?? Bringing together the best qualities of two great plants, x Fatshedera lizei ‘Angyo Star’ is actually a hybrid of Japanese aralia (Fatsia japonica) and English ivy. 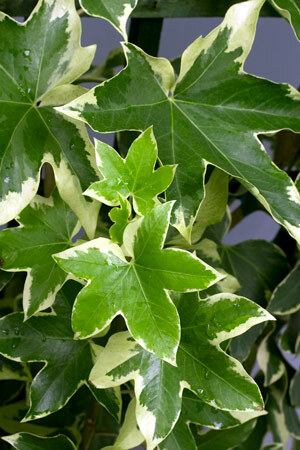 Large, star-shaped leaves with creamy white variegation in the margins brighten up shade and dappled sun areas of the landscape. ‘Angyo Star’ stems have a vining habit, but will not root or attach to structures. Plant in well drained soil, rich in organic matter, for best results. Water thoroughly on a regular basis and allow the top inch or two of the soil to dry before watering again. Feed with a balanced fertilizer and prune weak branches in spring to gently boost new growth. Fatshedera ‘Angyo Star’ can also be used as an indoor houseplant, but will typically have fewer pest problems when grown outside. Low light and overwatering can make this plant more susceptible to spider mites, scale insects and mealybugs. Grow on a trellis or add stakes to support plants in an upright form. Use ‘Angyo Star’ as a focal point in a shade combination container or train against a wall or fence as an espalier.